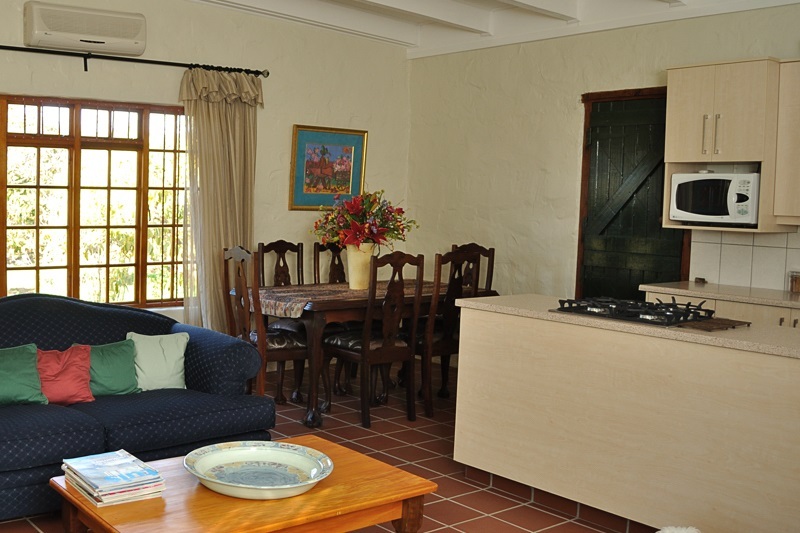 Nestled at the foot of the Langeberg, next to the Kingna river, lies this beautiful Guest cottage in the town of Montagu. 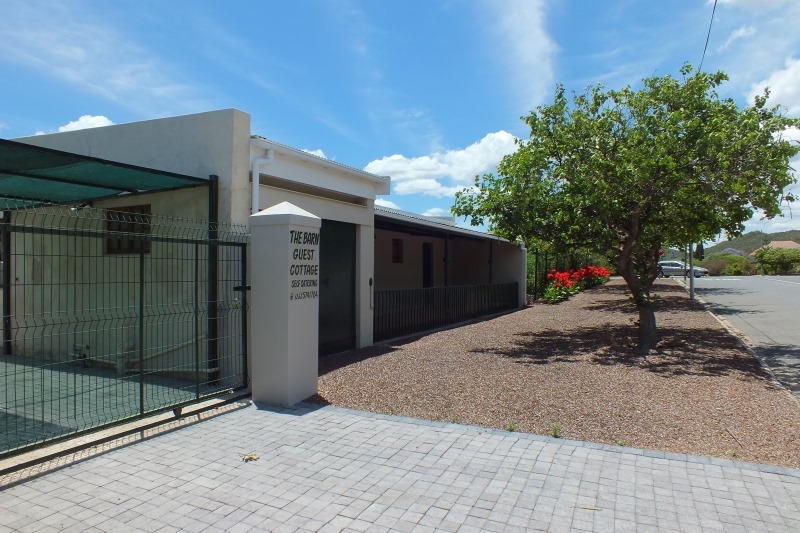 What started out as a jail many years ago was converted into a barn and most recently completely renovated into a most beautiful self-catering guest cottage. 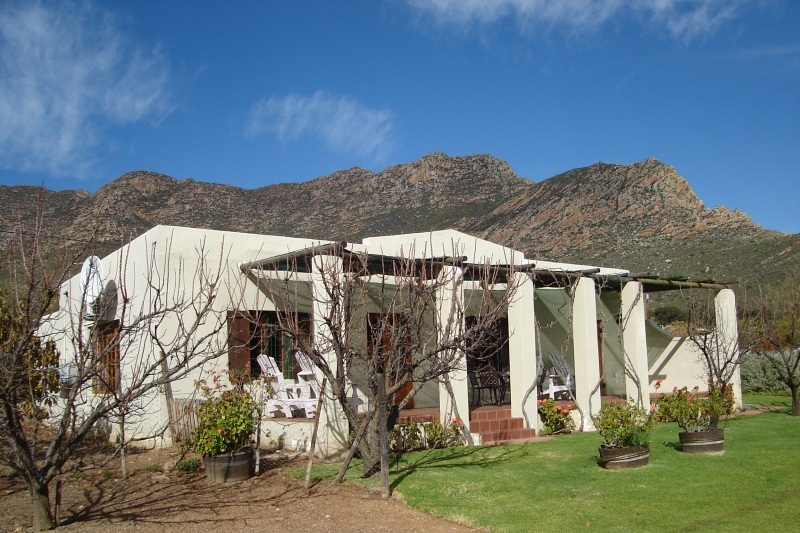 With an amazing view over the mountains surrounding the town of Montagu, the peacefulness and tranquillity is overwhelming. 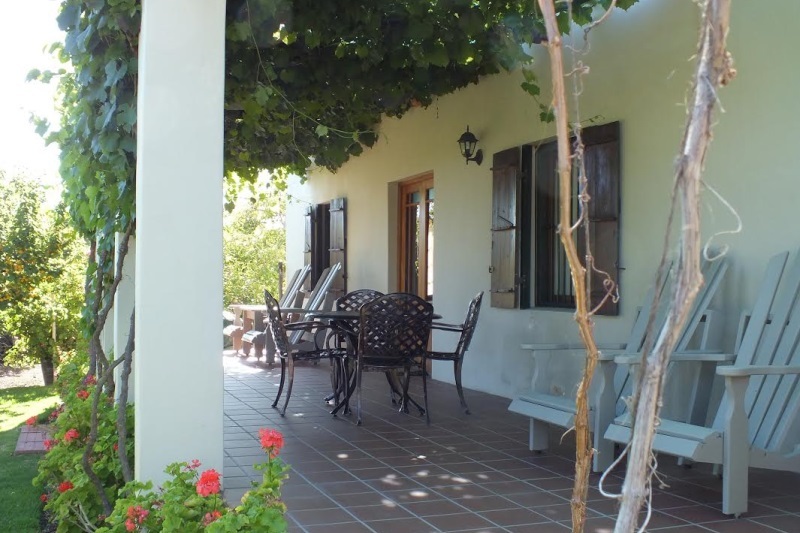 Surrounded by large sweeping lawns and a beautiful garden, this is the perfect get away, providing ample places to visit in Montagu, to indulge in a tour of the famous Robertson Wine Valley and to explore the fullness of the Breede River Valley. A visit to the famous Montagu hot springs should not be missed. Add to this other amenities such as golf, rock climbing, hiking trails, etc. and you have a wonderful time to look forward to. Once the sun sets and the serenity of the Karoo night settles in, you can take a stroll to visit one of many small and cosy restaurants nearby. Or you can light up your own fire for a braai, sit outside and enjoy a glass of wine. Make your reservation now by clicking the blue button below, you won’t be disappointed. 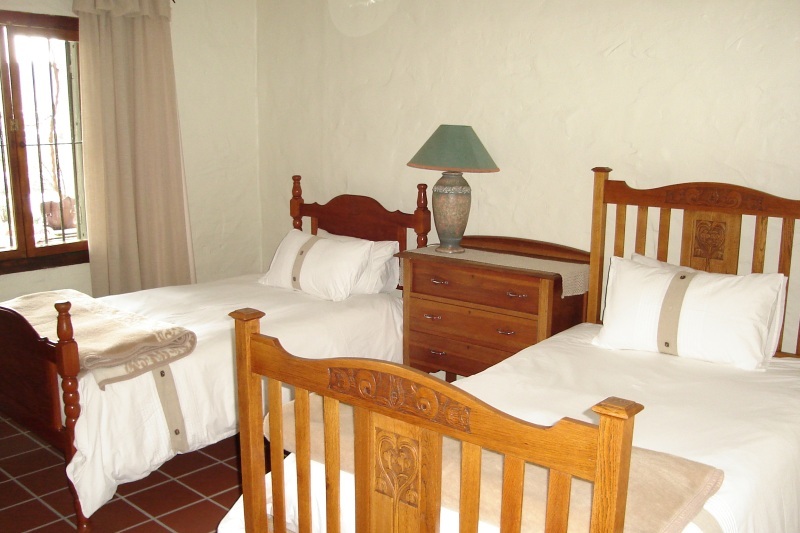 The main bedroom has an antique oak wood double bed with French doors opening up onto the patio. 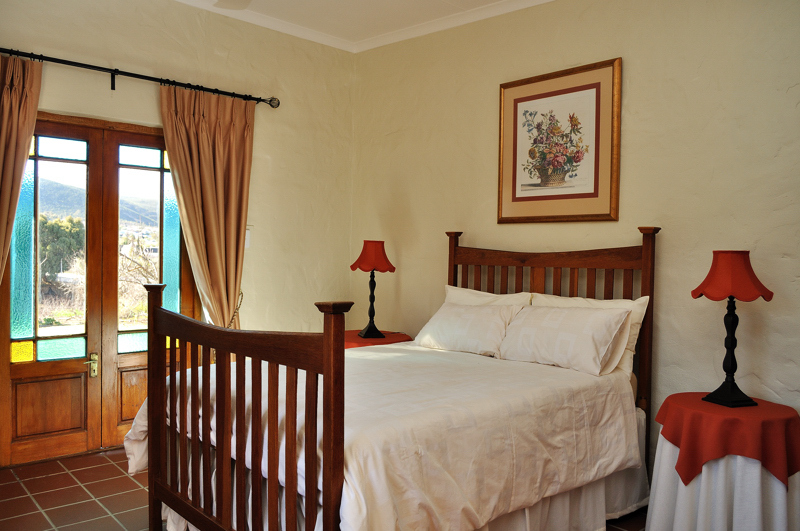 This room has an undisturbed view on the mountain surrounding Montagu. With a heating panel, winter is assured to be comfortable. Furnished with 2 x ¾ antique beds and the old jail bars are visible in the window frame. With a heating panel, winter is assured to be comfortable. 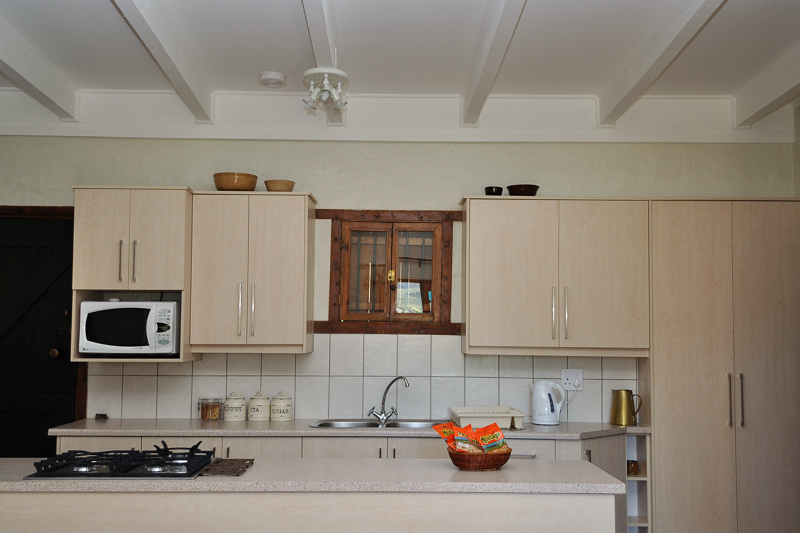 Spacious open plan kitchen fully equipped to meet all requirements. Cooking can be done on the gas stove, supplemented by a microwave oven. Fridge available. Solid wooden dining table seats 6. The family lifestyle lounge area has comfortable seating and opens up onto the patio area. DSTV available. Doors open onto the patio area with direct access to the rolling lawns outside. Covered with grape vines, the patio forms the nucleus of the Cottage, with splendid views of the surrounding mountains and leading onto rolling laws. Seating with an outdoor table provides the ideal spot for sundowners. 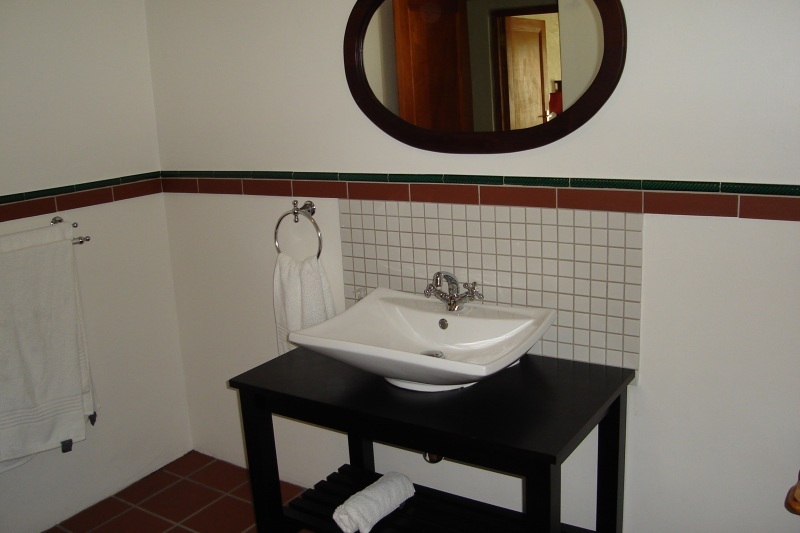 Spacious with a very large shower, toilet and luxury wash basin.